"Sometimes, putting yourself first is truly a sacrifice. Claire Nixon and Adam Parker each have a painful past too heavy to carry alone. Claire once tried to push Adam away but his relentless pursuit of her heart made her walls come crumbling down, and now they know they’re much stronger together than apart. But now Claire's attending college a hundred miles away from Adam, and the distance is forcing a crack. To add to the strain, Adam is sent to Hawaii on business, and doubts start creeping into both their hearts. Claire’s also dealing with her ex, rock star Chris Knight, being back in her life. Chris wants Claire more than anything, and he knows just how to get her: only he has the power to mend the final missing piece of Claire's broken heart. How can Claire ever choose between taking a chance on new love, or a second chance at having a family and a home?" Pieces of You, the second in the Shattered Hearts series by Cassia Leo published by Transworld (in the UK and Australia), is structured in a different way to the first book by follows directly on from Relentless. The chapters in Pieces of You alternate between being told from Chris, Claire and Adam's point of view. It works perfectly, with Cassia Leo's style of writing, and the regular shift in perspective is not at all disruptive for the reader. I have to say that I enjoyed the second book slightly less than first as the storyline is frustrating but the momentum started to build again towards the end, and as the last page was read, I found myself wishing I had the third instalment so that I could complete Chris, Claire and Adam's story. By the end of this book, I found myself torn as to what decision I wanted Claire to make and we will all have to wait for the third book to find out what she does. The ending is fairly abrupt but it will leave you wanting to know more. There is a longer series published in the United States, and I suggest you avoid reading the blurb for the later books as it might ruin the anticipation and tension that will no doubt come with the third book, Bring Me Home. 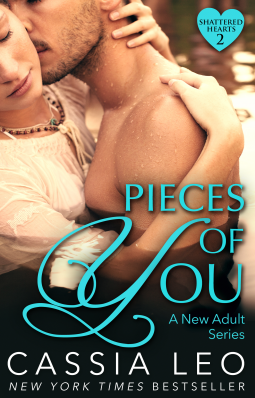 Thank you once more to NetGalley and Transworld for the free copy of Pieces of You in exchange for an honest review.